Part of my immersion or even my love for exploration is to try on food. What made it more exciting was when I did this in the country side. Expect this blog post to be updated always as I explore more of the Ifugao culture. This is one of the many kinds of native rice - the red rice. It is very healthy because it's organic. I value eating every piece of this. If you want to know the reason, click here. In the local dialect (it varies in different towns), they call this vah-vah. 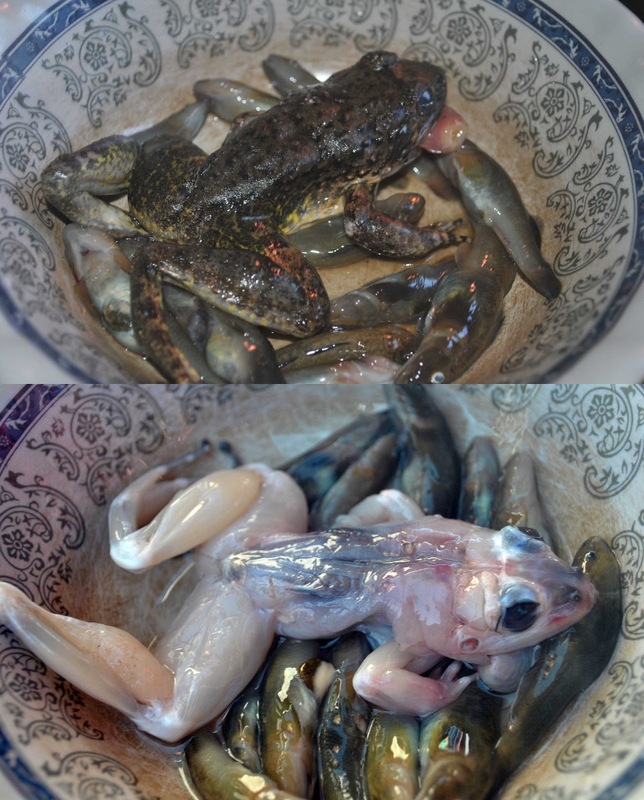 The first photo shows that it was freshly caught from the stream. Second photo - all cleaned up from the inside and out. The small fish is called gajiw. We deep fried these. It was our breakfast. Thanks to the locals who got this for us. Seriously . . . the vegetables have different taste compared to the metro. All of them are organic. You can taste the sweetness and you know that it was just freshly picked from their backyard. It's a carabao (water buffalo) meat. Cooked in soup with beans. I did not like it but the locals loved it. This is something familiar in the metro but just did not have the guts to eat it as it looks weird and dirty when sold on the city streets. In Banaue, I ate my first one day old chick. Hmmmm . . . it was good tasting it. That's it. Snails . . . shells . . . clams . . .
We were so hungry from the trek that I wanted to eat the shells as my tummy did not have any patience. Good thing they helped me open it. Pinikpikan is the most popular traditional food they have in Ifugao. All the times I went to Ifugao, they had this everywhere. In Banaue, they call it Inlagim. They have a different way of butchering the chicken or duck compared to neighboring places like the Mountain Province. In Ifugao, they say they do it "killing me softly" style. The first step is to buy a LIVE chicken. They say the native chickens are better than this one. I couldn't look at it the first time but hey . . . they are doing this in every house here. They do it through the neck and squeeze the blood from it. They put vinegar on the bowl first so the blood won't clot. Every part of the chicken is being eaten except the feathers. Here's the duck pinikpikan / inlagim. See how the drake looks at me . . . as if I was the reason why he's there. For them to get the feathers, they burnt it so it would be easier. Then they take out the intestines. This is the duck inlagim / pinikpikan. It's a lot tastier than the chicken. Though they have different taste. I still can't have my taste buds to identify. It's not my favorite but yeah I eat it. It's good when it's hot especially on a cold weather the Ifugao has. One of the nicest meals I had. Here we had Duck Inlagim and another viand with a wonderful view of the terraces in Kiangan, Ifugao. By the way, following you through GFC now. We serve inlagim sa Banaue Hotel. Ang Banaue isang municipality . Meron pa bang ibang menu na meron ka from ifugao? The way they prepared the "inlagim" an patu and chicken is not the pinikpikan way. 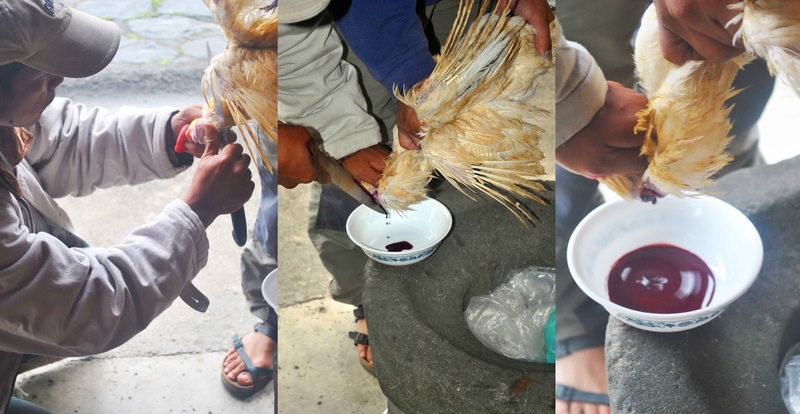 in Ifugao they let the blood drain from the butchered fowl, as demonstrated in the pictures above. Pinikpikan on the other hand is when the fowl is whacked repeatedly (pinipik-pik) around the body while it's still alive to let the blood clot internally before it's butchered, Hence the phrase "KILLING ME SOFTLY" this practice is more common in Benguet and the Mountain Province.